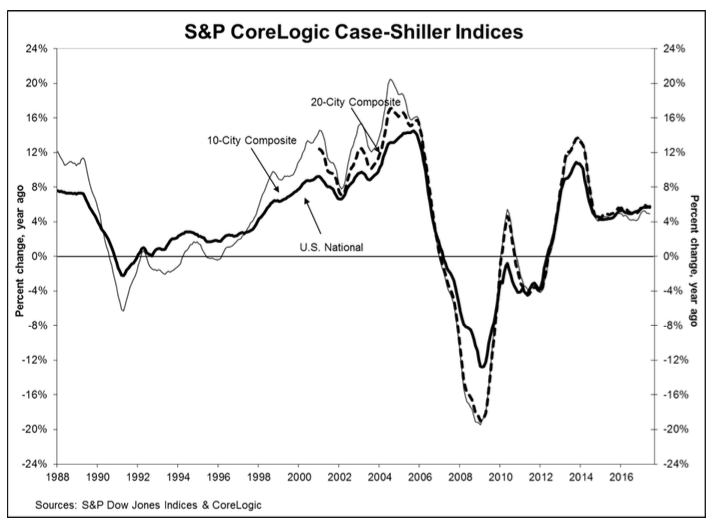 June’s S&P/Case-Shiller Home Price Index shows that home prices are continuing to ascend — impacting affordability and the overall robustness of the housing market. June 2017’s national index comes in at 192.60, a 5.8 percent year-over-year increase from June 2016 and a seasonally adjusted 0.9 percent month-over-month increase. “Currently the months-supply of existing homes for sale is low, at 4.2 months,” he added. “In addition, housing starts remain below their pre-financial crisis peak as new home sales have not recovered as fast as existing-home sales. 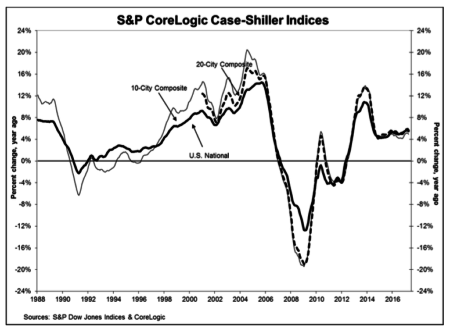 “Rising prices are the principal factor driving affordability down. However, other drivers of affordability are more favorable: the national unemployment rate is down, and the number of jobs created continues to grow at a robust pace, rising to close to 200,000 per month. The 10-City and 20-City composite boasted 4.9 percent and 5.7 percent year-over-year gains, respectively, and the cities of Portland, Oregon; Seattle, Washington; and Dallas, Texas; led the way. Seattle reported a 13.4 percent year-over-year price increase, followed by Portland with an 8.2 percent increase. Dallas shored up the end of the pack with a 7.7 percent increase. The 10-City and 20-City composites reported 0.9 percent and 0.7 percent seasonally adjusted month-over-month increases, and no city reported a negative monthly price change.